In September 2017, the island of Puerto Rico and many other Caribbean islands were devastated by hurricanes. Vegetation, agriculture and non-cement homes and buildings were destroyed, along with the infrastructure that supported electricity, drinking water, and telecommunications. 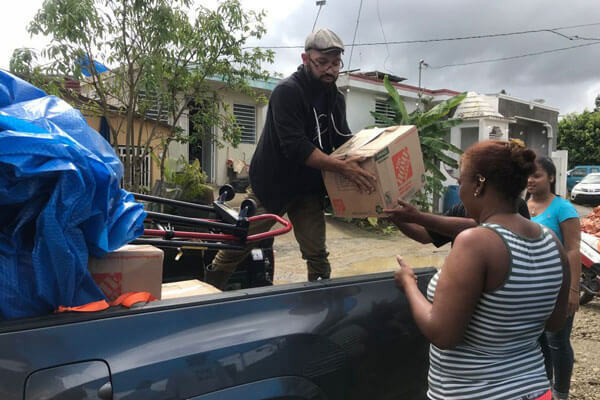 On March 25th, 2018, humanitarian aid collected at the MA Center in San Ramon went to one of the neediest communities in Puerto Rico. 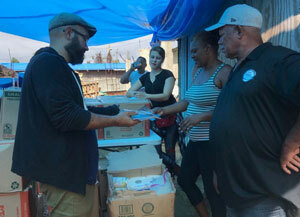 With the support of locals, three thousand pounds of food and other essentials were distributed. 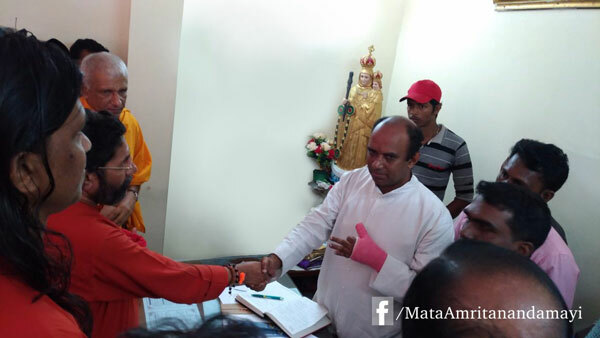 The Mata Amritanandamayi Math has donated Rs 2 crore [$310,800 USD] to Kerala State’s Cyclone Ockhi special relief fund. 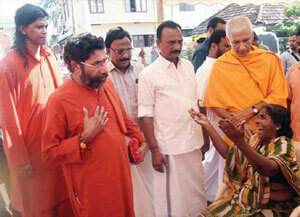 A cheque for the amount was handed over by Swami Amritaswarupananda Puri, the Vice-Chairman of the MAM to Kerala Chief Minister Pinarayi Vijayan at the CM’s office in the capital. Cyclone Ockhi, the most intense tropical Arabian Sea cyclone in years, hit the Kerala coast last week without warning. Heavy rain and strong winds claimed many lives and inflicted widespread property destruction. Many homes were destroyed. 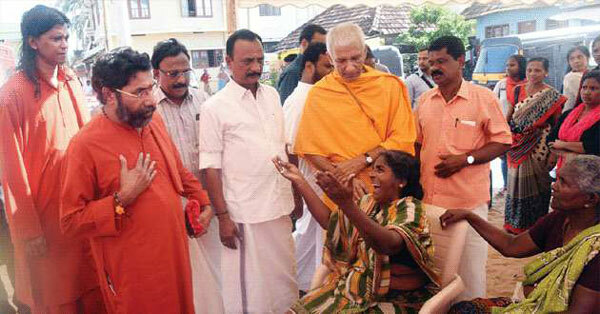 Local fishermen off the coast of Kerala’s capital, Thiruvananthapuram, were the worst affected. The bodies of some were found strewn across their boats and more than 270 fishermen are still missing. The exact death toll remains unknown. Many of the victims’ families are now totally uprooted, having lost their loved lones as well as their security, food and shelter. Amma responded right away by announcing a package of Rs. 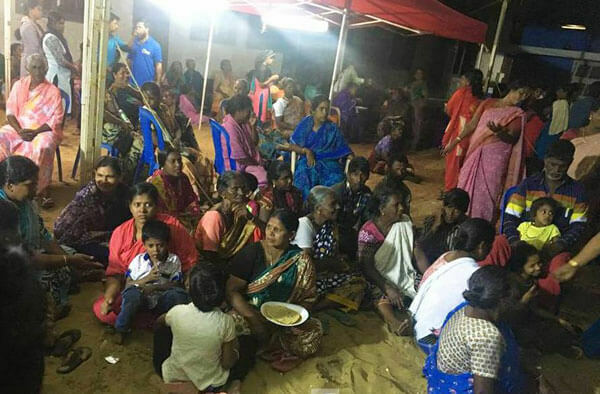 100,000 in immediate aid for each of the families of the fishermen who died in the cyclone, and pledging to rebuild houses that were destroyed by the cyclone. 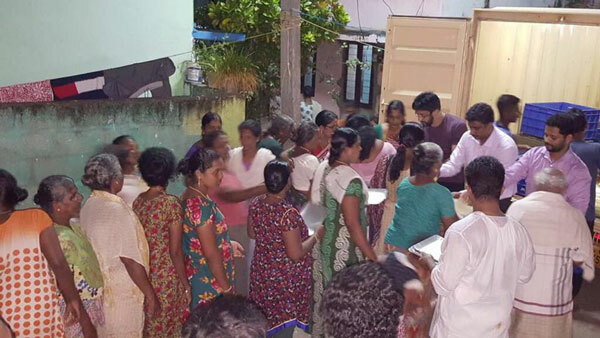 Our volunteers set-up food relief camps for the widows and hundreds of affected families. Free treatment for the injured was offered at Amrita Hospital. The Math is also working closely with local church authorities to maximize outreach. 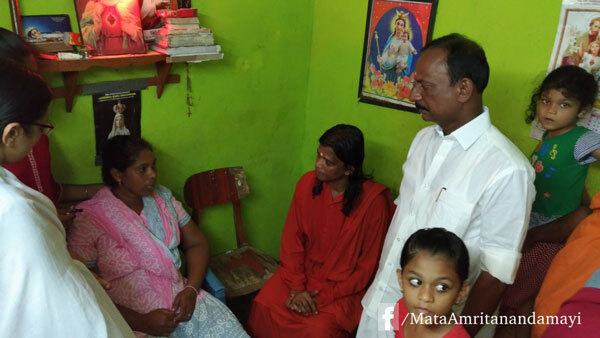 Senior swamis of the Mata Amritanandamayi Math and many Embracing the World volunteers visited the camps and homes in affected communities including Poonthura, Vizhinjam and Valiyathura to console the victims and families. 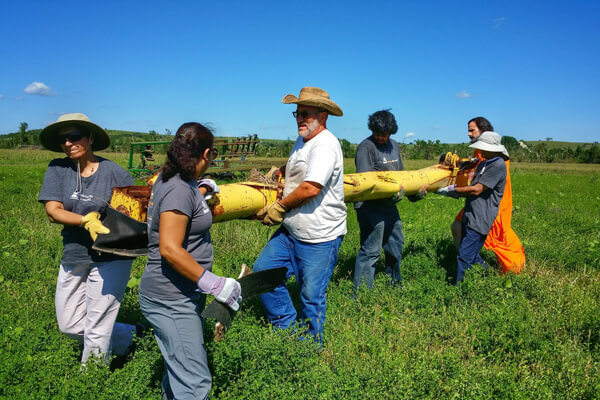 Over the past week and a half, volunteers from the Houston chapter of AYUDH have been participating in city-wide efforts to assist those impacted by the devastation of Hurricane Harvey. The hurricane, which has left thousands of people without their homes and destroyed local infrastructure, ravaged the Houston area from August 24th to September 2nd. 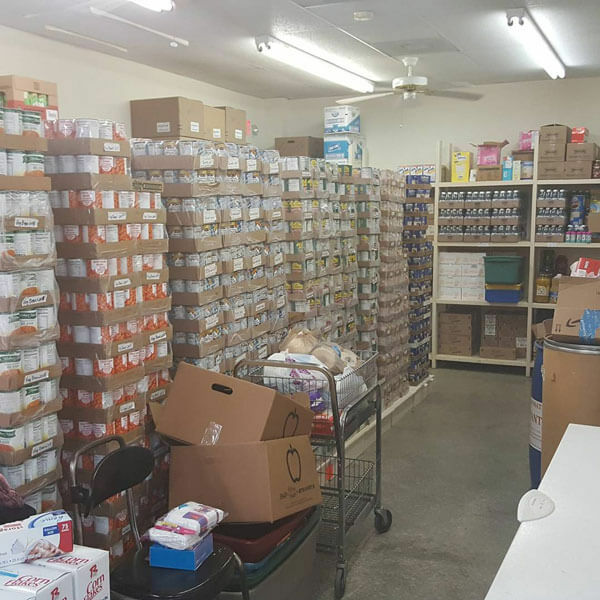 Through a range of aid efforts led by local volunteers, AYUDH been organizing regular donations, meal preparation and support for those most impacted by the storm. As the weather created a hazardous environment in certain areas in Houston, temporary shelters were set up in stadiums, convention centers, churches and even schools. They were in high demand for supplies. 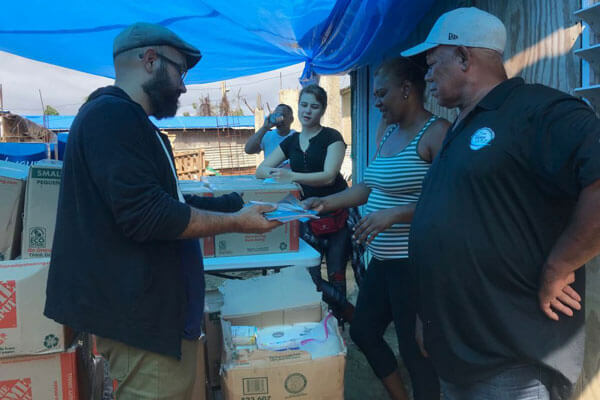 Within the first two days after the storm, AYUDH volunteers were able to deliver over 100 care packages, consisting of everyday essentials such as toothpaste, toothbrushes, deodorant, tissues, granola bars and other various snacks. 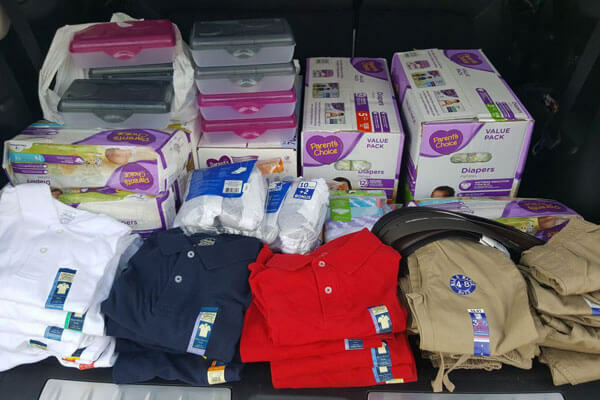 These care packages were accompanied by baby food, baby wipes and canned foods which were brought to a donation center located on Dairy Ashford Road. On the same day, other volunteers donated dog food to a local pet shelter. 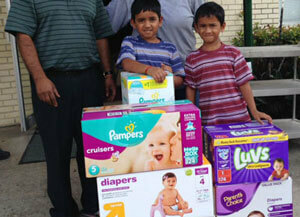 The next day, members in Katy were able to locate temporary shelters in need of donations. 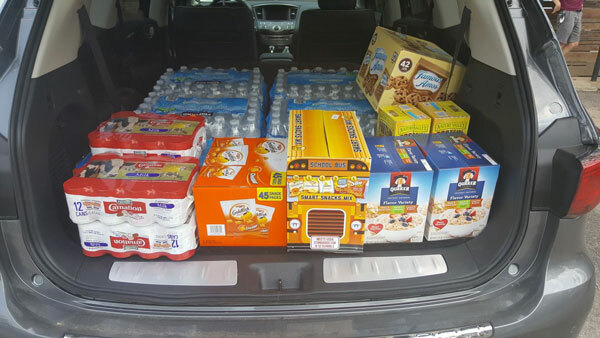 AYUDH members delivered loaves of bread, bottles of jam, boxes of croissants, packets of tortillas, boxes of cereal, containers of chips and Gatorade to Cinco Ranch High School in Katy. 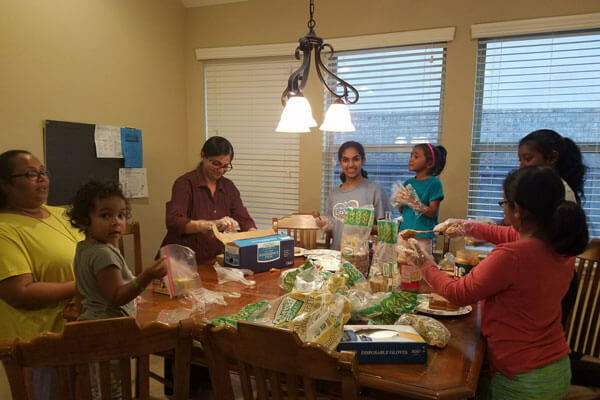 AYUDH also delivered dishing washing soap, diapers, cereal and snacks to an independent shelter in Katy, as well as two trays of homemade food, water and snacks to First United Methodist Church. During the remainder of the week, volunteers continued to assist shelters. 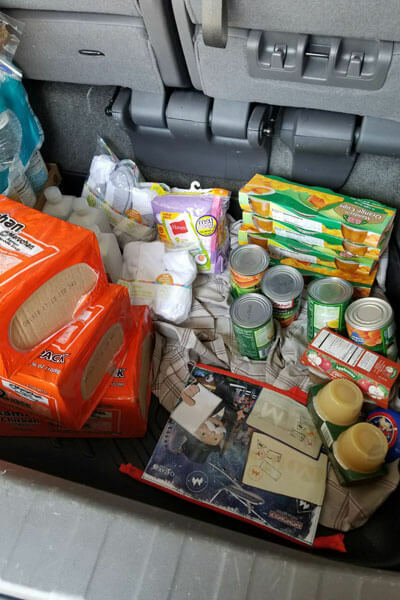 While visiting St. Theresa’s Church shelter, volunteers learned what they needed and then provided them with items from their list of requests. 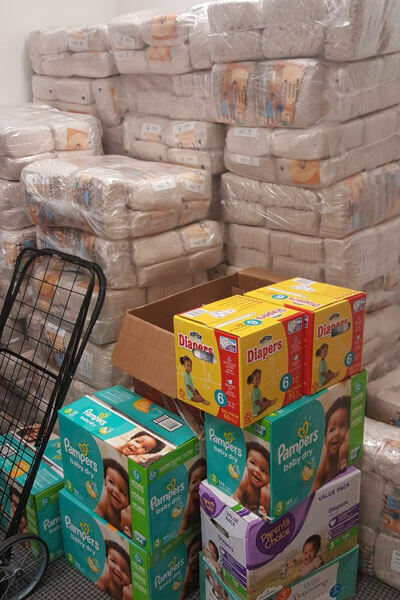 Members were able to donate bread, water, snacks, sanitary items, diapers and feminine products. 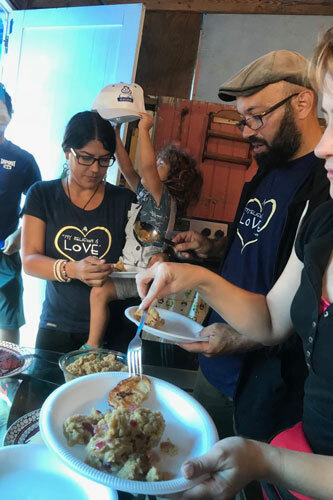 Later that day, volunteers also prepared 63 sandwiches and two trays of pasta to serve to the homeless through an organization known as Food Not Bombs. 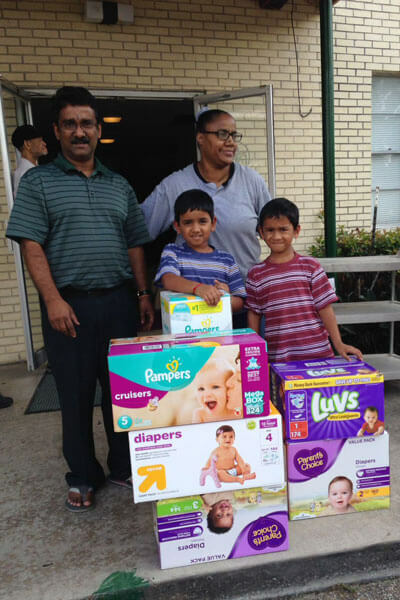 AYUDH Houston is currently working on focusing on one specific organization’s needs by assuming and fulfilling the entire list of items needed by the St. Lawrence Church in Sugarland. 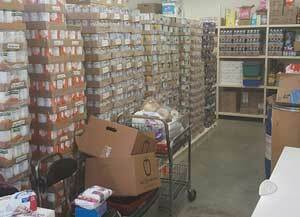 Their goal is to collect, assemble and deliver all the items they need. 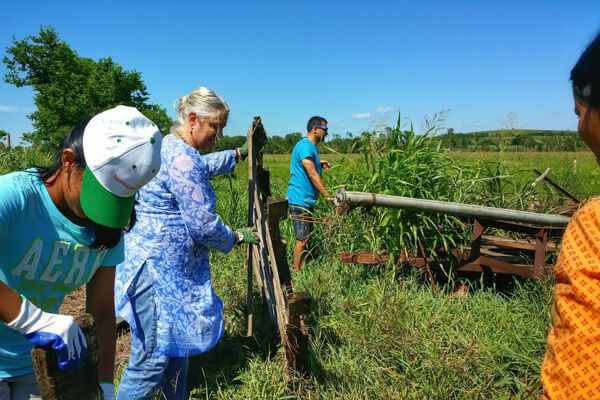 Thus far, AYUDH has managed to assist different parts of the Houston Metropolitan area consisting of the City of Houston, Sugarland and Katy. 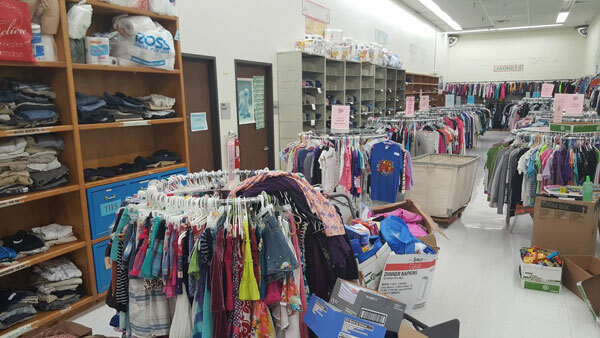 Volunteers’ upcoming projects include assisting families to restabilize their lives by providing much needed aid to families through an organization known as Adopt-A-Family. 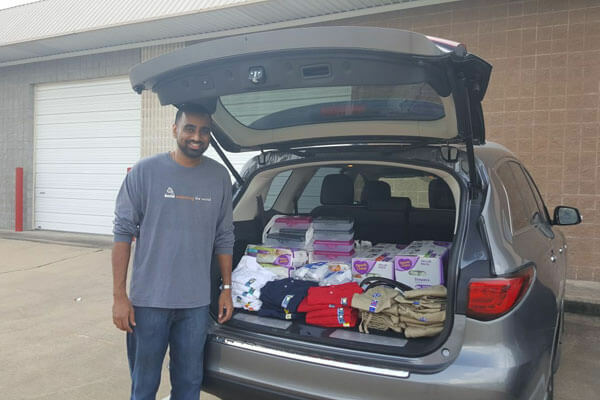 AYUDH is also assuming responsibility for other organizations’ entire lists of items, one by one, in order to deliver focused, undivided attention to one organization at a time and organizing members and families into groups of volunteers to serve at shelters and damaged homes during this time of great need in the Houston community. Hurricane Harvey, one of the costliest and damaging tropical storms in United States history, devastated many lives and rendered millions of people homeless, without access to adequate food, water, and basic resources. Beginning on August 25th, 2017, the hurricane ravaged Houston, Texas and the surrounding areas, leaving destruction in its path. 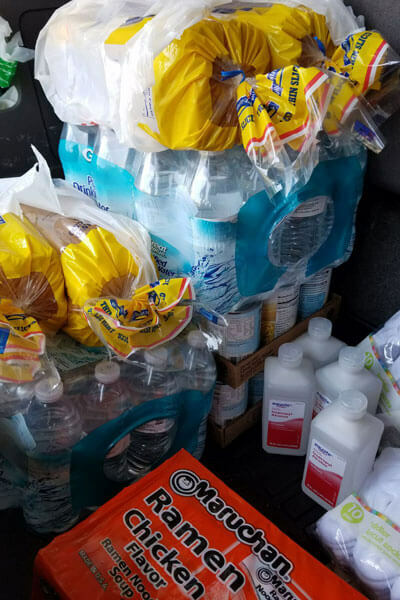 The Houston chapter of Embracing the World has been responding to this disaster as volunteers from the state of Texas are hand-delivering food, pet supplies and basic hygiene products to several shelters and churches across the Houston area. 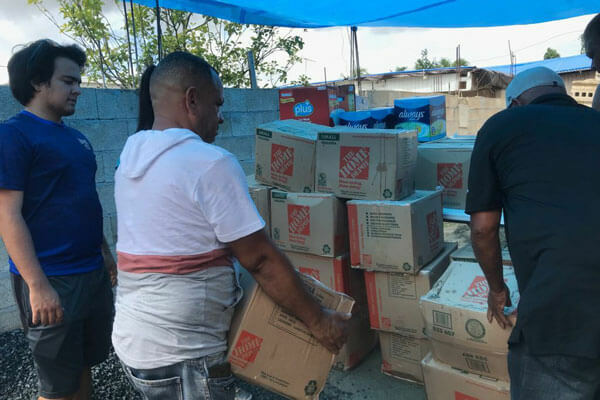 Supply kits, containing baby wipes, feminine hygiene products and fresh water are being distributed in several locations, while fresh meals and packed lunches are being provided to families forced to leave their homes because of the storm. On the evening of July 7th 2016, multiple tornadoes struck Greenwood County Kansas in both a sparsely populated rural area as well as the town of Eureka, KS. Over 50 homes were damaged in the town and nearly half of these were completely destroyed. In the rural countryside, two farmsteads were completely destroyed, one suffered damage only to barns and equipment and the nearby river and forest were devastated for miles. A group of local Embracing the World Volunteers were inspired to come together led by Br. 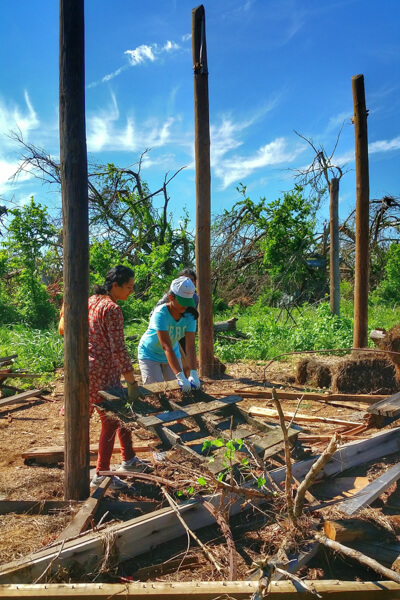 Shantamrita Chaitanya of the MA Center in Chicago, on Saturday August 13th to assist with continued tornado recovery efforts. 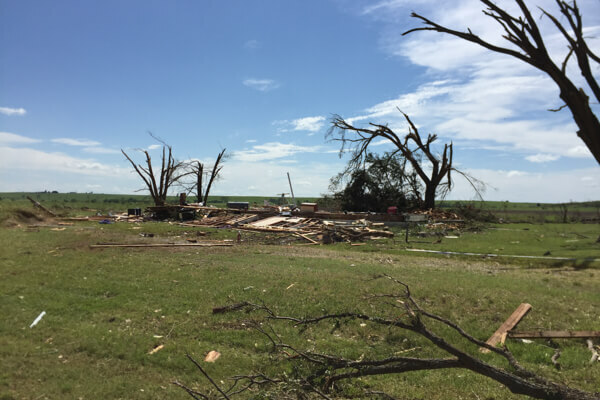 Working in the rural area 7 miles northwest of the town of Eureka, a field of scattered debris left by the tornado was cleared. This effort will prevent further damage to farmer’s equipment when the hay and corn fields are harvested later in the summer. 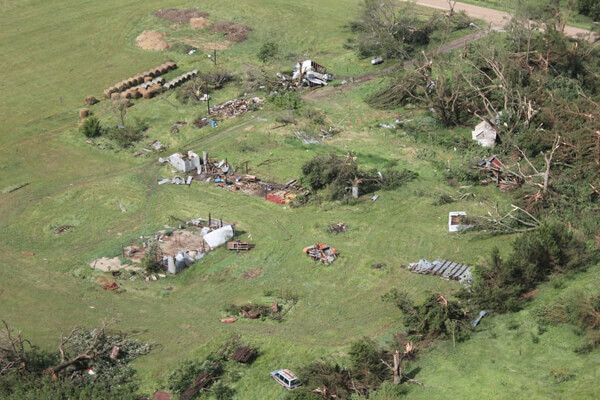 The recovered debris included fencing materials, debris from nearby homes that had been leveled and shredded metal parts of farm equipment which had been stored in a nearby barn that had been destroyed by the tornado. So much debris was present in the field that it would have prevented the farmers from even being able to successfully harvest the crops. The devastation to the nearby river and forest was evident and will take many long months if not years to restore to its previous state. 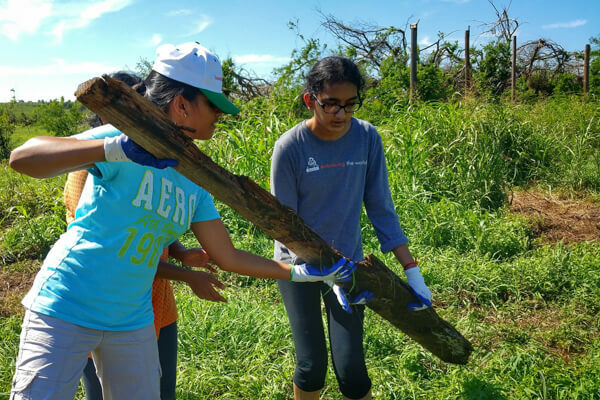 Embracing the World volunteers will continue to provide service to the local community as it recovers from the devastating effects of the storm.